The power plant could not be abandoned after the meltdown. Over the past 25 years, thousands of people have continued to work at the facility, monitoring the state of the reactors. The Chernobyl nuclear power plant, once the biggest in the Soviet Union, no longer produces any energy, although much energy is spent maintaining the facility. Apr. 26, 1986, Chernobyl was the site of the world’s worst nuclear disaster, an event that has become a catchphrase and comparison for any nuclear accident since. Twenty-five years since the disaster, the facility still presents challenges. Igor Gramotkin, the general director of the Chernobyl nuclear power plant, spoke with Rossiyskaya Gazeta about what life is like at the plant today and what problems still lie ahead. Rossiyskaya Gazeta: Who are the people under your watch, Mr. Gramotkin? 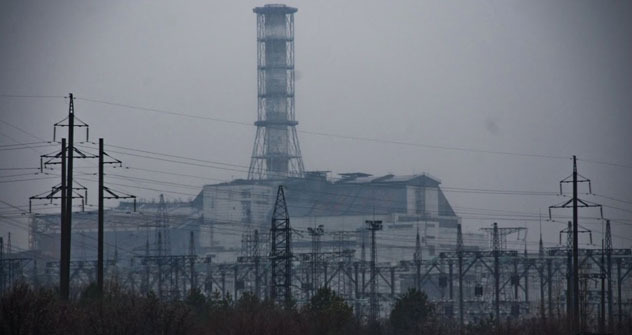 Igor Gramotkin: The Chernobyl power plant currently has 4,400 people on board who keep the three intact and one destroyed reactors from causing any further problems. Furthermore, we have people working in the restricted area where significant radiation pollution was released after the meltdown. The power plant's protected territory is 298 hectares, encompassing 327 buildings and facilities, including 150 thousand tons of equipment with different levels of surface radiation pollution. Throw in 1.3-1.4 million tons of polluted building constructions. All in all, there are around 1.5 million tons of various materials with surface radiation. The power plant's entire area, including all auxiliary structures, is roughly 3,000 hectares. This is an enormous city that needs to be maintained and provide for the safe operation of the work at hand. RBTH: How did you end up at the Chernobyl power plant? I.G. : I was born in Kazakhstan. I studied in Siberia at Tomsk Polytechnical Institute and I was sent to the Chernobyl power plant in 1988. I’ve scaled the career ladder from operator to plant director. It's tough for me to talk about my roots. I live and work in Ukraine; I love this country. I like being here and especially like doing what we are doing at the moment. Believe me, right now you won't find more difficult work in the nuclear power industry. RBTH: What motivated you when you took on your assignment to Chernobyl? I.G. : Back in 1988, I set off to save the Motherland, and there's nothing more to it. I had no doubt that the Chernobyl meltdown presented the biggest problem humanity had ever seen. I saw this as a challenge. Being young, confident, and even somewhat brash, I went to Chernobyl out of my own free will. RBTH: You arrived at the Chernobyl power plant when the fourth reactor was already in a sarcophagus. What did this mean at the time and what is your assessment of the work now? I.G. : This was a completely one-of-a-kind object for 1986. The people who did this accomplished a real feat: They were able to close off the destroyed reactor under extremely harsh conditions. What's more, what we got was such an idiosyncratic construction in terms of engineering, that when they were assembling it, people weren't completely confident whether it would be able to hold up or not. But now it is quite clear that this construction has been up to the challenge. RBTH: The sarcophagus, nonetheless, was found long ago to have problems. I.G. : What did you expect? It would be impossible to build a flawless construction under radiation and under an extremely short deadline. What's more, the draft project was developed haphazardly. The sarcophagus, however, was assembled and brought into operation. In 1997, or ten years later, a New Safe Confinement was planned to be built to increase the construction's safety. This plan has already been fulfilled. RBTH: But in Russia, especially at the Kurchatovsky Institute, people have said that there is a lot of leakage from the confinement and that the girder beams could come crashing down any day now. I.G. : There were some problems, but there's no use in making a big deal about it all, especially keeping in mind that in 2008 we did some unique work to stabilize the sarcophagus’s bearing constructions. What I am especially proud of is that this was done in close contact between Atomstroyexport and Ukrainian contractors. This cleared the way to make the construction safe and secure for another 15 years. Saying things about large holes does nothing but spread myths. RBTH: How much fuel do you believe was left in the reactor after the explosion? What is this fuel's condition under the confinement? Will the fuel somehow be extracted from there? I.G. : The plan passed in 1997 envisioned two stages: First, stabilize the confinement and build the new, secure confinement that will cover the fourth reactor along with the existing sarcophagus. Second, disassemble the confinement and recover the fuel. There is approximately 200 tons of fuel in varying condition inside the sarcophagus that we need to transfer to controlled storage. Furthermore, the confinement itself has around 30 tons of dust that contains transuranium elements, which present an increased risk to the environment and humanity. Therefore, after the New Safe Confinement is built to complete the first phase, I hope that Ukraine, using donor support, will start the second stage, which entails disassembling unstable constructions within the confinement, removing the fuel mass and transferring it to controlled storage. RBTH: When can we expect this to happen? I.G. : We are looking to finish the New Safe Confinement in October 2015. The new confinement should serve its purpose for a 100 years. RBTH: How much will the new confinement cost and who is financing it? I.G. : The cost as of today is 980 million euros. Donor countries have founded the Chernobyl Shelter Fund to cover the costs. The fund until recently had 20 donor countries, while at a conference in Kiev the number was announced to have risen to 40. The most urgent challenge for us is to raise around 500 million euros for one project and 140 million for another. What's more, as far as I know, China, India, Saudi Arabia and Kuwait have agreed to help out as well. Everyone understands that Chernobyl is not just Ukraine's problem and Ukraine cannot handle the burden on its own.